Mr. Ditmir Bushati is the Minister of Foreign Affairs of the Republic of Albania since 15 September 2013. 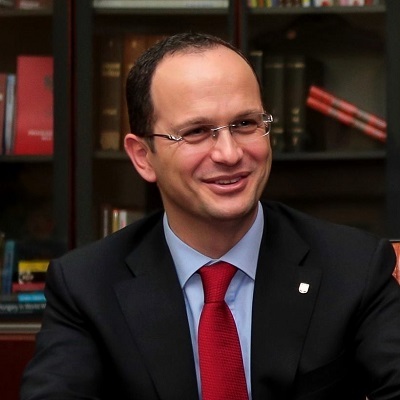 Mr. Bushati graduated from the Faculty of Law of the University of Tirana in 1999 with the highest honours, and holds a Masters Degree in Public International Law (LL.M) from Leiden University in The Netherlands (2001). Prior to his political career Mr. Ditmir Bushati was a civil society leader and a Founding Director of the European Movement in Albania. He then served as Director of Legal Approximation at the Albanian Ministry of European Integration. In that capacity he was part of the team negotiating the Stabilization and Association Agreement with the European Union (SAA). Mr. Bushati has worked as Advisor on European Affairs to the Deputy Prime Minister, as Legal Advisor to the Constitutional Court, the Office of the President of the Republic of Albania and the International Criminal Tribunal for the former Yugoslavia. Mr. Bushati has lectured on European Law and the EU enlargement process at different institutions and universities in Albania and Kosovo. He has published numerous scientific papers and articles in areas related to the EU enlargement process, public international law and European law.